Bird flu, Chikungunya fever, SRAS and West Nile Virus have all been in the news in recent weeks. They are a reminder that there are still many contagious diseases around the world, and that preventing their spread is difficult. Previously confined to the Intertropical Zone, these diseases are now coming closer to home. Since 1998, CNES has been lending its support to tele-epidemiology projects aimed at deploying monitoring and early-warning systems. Winter 2005. An unexpected wave of cold weather forces birds from the Caspian Sea to extend their migration to the marshes of eastern France. Soon afterwards, ducks carrying the H5N1 virus are found dead there. All birds in a contaminated poultry farm have to be culled. In France, the immediate economic impact of this outbreak on poultry breeders is unprecedented. At around the same time, the Chikungunya virus arrives in Europe after an epidemic outbreak in the Indian Ocean. Although victims of the disease in metropolitan France are all cases “imported” from abroad, the aedes aegypti mosquito that carries it are already present in the south of the country. These mosquitoes could spread the disease, so mitigation measures are required. Several European projects, particularly in the Provence-Alpes-Côte d’Azur region of southern France, are now setting up bird flu monitoring and early-warning networks. In the same region, researchers are working to gain a better understanding of the mechanisms and conditions causing the spread of West Nile Virus, also borne by mosquitoes. In 2003, this virus mainly affected horses, but it has spread across the United States in just 2 years. Communications, data collection, location and Earth observation satellites are key tools in the fight to keep epidemics in check. 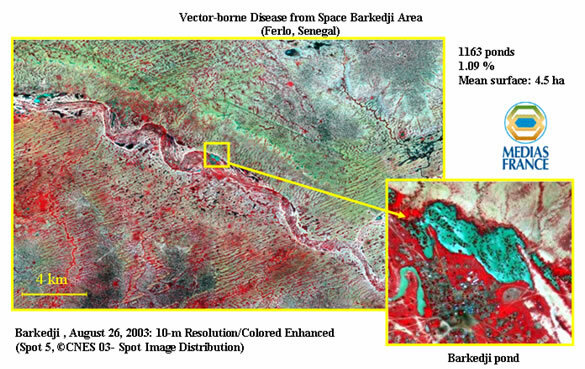 Satellites obviously don’t track swarms of parasite-bearing mosquitoes or infected populations. Instead, they enable collection of health, climate and environment data that have a direct impact on ecosystems likely to harbour vectors of disease. They are able to monitor factors that make diseases more likely to spread, such as stagnant water, wind or plant cover. Since 1998, CNES has been lending its support to tele-epidemiology projects aimed at deploying monitoring and early-warning systems. 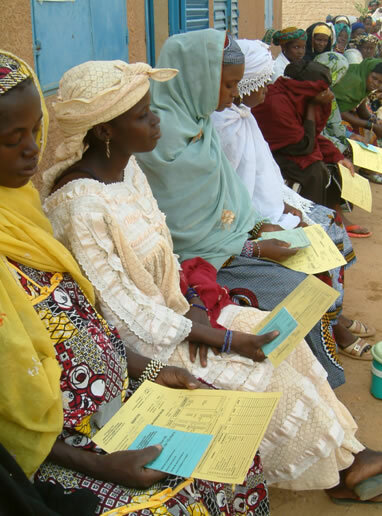 The Emercase network in Senegal is monitoring fever risks in the Rift Valley. In July 2003, the system detected a high risk of an epidemic following intense hailstorms. A vaccination campaign was started immediately to stop the epidemic in its tracks. Emercase is just one project among many that should help to set up an early-warning system in Europe to assist health authorities.